Recently I was looking at Google Trends. For anyone who doesn’t know, Google Trends is a fantastic service that plots search trends over time, and provides a great insight into what may realistically be expected moving forwards. Whilst doing some research for our app StepWise Pedometer, one term I searched for was calories. Whilst not entirely surprising, the results certainly appear quite telling! Every year since the trends began a sharp rise occurs once a year, followed by, what is in the main a relatively steady decline. What is even clearer is when this happens! If we look at the trend over the last 12 months, we can see that the sharp rise occurs just as people are making their new years resolutions. The lowest point of the year was December 22 – 28 2013. Yet the following week, December 29 2013 – January 4 2014 sees the trend return to that of early November. Clearly, from early November until the holiday period people really seem to loose interest! Moving forward just one week to January 5 – 11 2014, we continue to see the steep climb to what is just short of the most active time in the 12 month period. Finally, the week with the highest search is actually January 12 – 18 2014, where the searches top out, although the climb this week is relatively small compared to the previous two weeks. The trend then tails off relatively smoothly over the rest of the year until early November when it drops significantly again. I find this quite telling. Those new year resolutions really do seem to fade off, albeit over the course of the year. Moreover, it is clear that the most inspired time for people is right after the Christmas holiday period when no doubt we all over indulge! I went on to overlay the search term diet onto the last 12 months view. As you can see above, the term diet (shown in red above), pretty much follows the same trend as that for calories, yet is the term that shows the greater number of searches. Then to add another overlay this data with the search term exercise. So, above we see the addition of exercise (shown in yellow above), and can see that it loosely follows both the calories trend and the diet trend. However, whilst the trend does try to follow, the the search volumes are both much lower, and the sudden jump in search traffic at the end of December and early January is much less. What initially struck me was that exercise seems to come lowest of the two options to burn calories, one being to diet (which I know isn’t strictly burning calories, but rather reducing calorie intake), and the other being to exercise. Certainly an interesting insight. However, I tried one last search term, fitness, and my faith was restored! Adding fitness (shown in green in the chart above), and we can see that once again the trend pretty much follows that or calories. Perhaps people don’t like actually going in search of exercise, rather hoping that fitness can be achieved some other way?! Walking has to be one of the easiest and quickest ways that we can improve our fitness, and yes, it is exercise. Are you a walker, a jogger, or a runner? Why not keep track of your distances and your average speeds over time? Why not look at how many calories you can actually burn just by walking, jogging or running? Whats more, look at how those calories burned actually translate into fat burn. 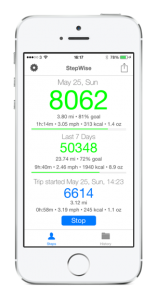 StepWise Pedometer for iPhone (compatible with iPhone 5S, iPhone 6 & iPhone 6 Plus) tracks all of this and more. What’s more it integrates with the new Apple Health App on iOS 8. Try StepWise Pedometer today and start tracking your health now. You don’t have to wait for a new year! Surely its better to get a head start on your friends, come to think of it, why not get a group of friends together and challenge one another. StepWise let’s you share your results, so motivate one another and get fit and track your progress together. You can view more about StepWise Pedometer here. Or why not download it today?